The two youngest daughters of Ernestina br. 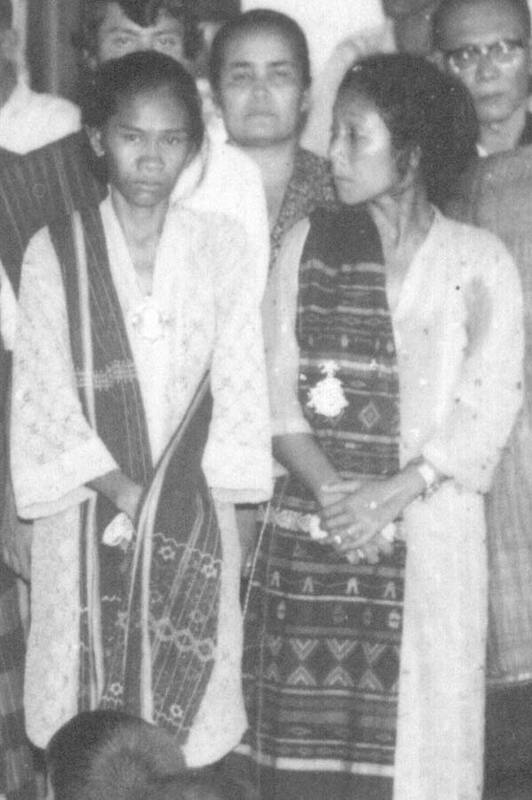 Hutagalung at the funeral of their father, Theodorik L.Tobing, in 1972 wearing ulos woven by their mother 60 years or so earlier before her marriage to Theodorik. On the left facing the camera is Helena br. Tobing, the youngest daughter and fifth child, wearing the ragi hotang (or huting) namarsimata over her shoulder. On the right facing the camera is Oloan br. Tobing second daughter and fourth child wearing the sadum showing the end without Ernestina's name. When asked in 2006 Oloan had no recollection as to why she and her sister chose those particular ulos to wear at the funeral. Ernestina had given the sadum to her daughter Oloan on the occasion of her marriage to Mr Hutagalung. Oloan subsequently gave the sadum to her niece, Vera, to help her with her business 'Vera's Ulos' in the 1980s and 1990s.